When I read this post on Smitten Kitchen I could not help being tempted. I only discovered leeks a couple of years ago. I think the delay in my leek enlightenment was due to never having had it as a child, and therefore not instinctively knowing how to use it as an adult. I think that a lot of my ingrained food ideas stem from the food I grew up with, but there are a couple of gaps as there are some things that my mom never fed us as kids, probably because one (or more) of us 4 siblings would have refused to eat it. And she was probably right. There are a whole lot of things that I didn’t like as a child; Mushrooms (always picked them out of my mom’s chicken-a-la-king), green pepper (also picked them out of my mom’s chicken-a-la-king), other colour peppers, mayonnaise (don’t know why, I was just scared of it); but thankfully my tastes have since matured and enjoy an array of colours, textures and flavours I did not know as a child. 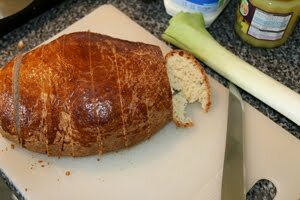 So one of the challenges with this recipe was that I could not find a brioche loaf at the shop. I’m sure that they must be available somewhere, maybe from a bakery or deli, but I thought the easiest solution would be for me to make one. I have made bread plenty of times in the past and I have good, strong kneading arms so a little bread doesn’t scare me. I am sure that there must be many brioche recipes out there with various merits, and to be honest the one I used was not great, so I am not going to post the recipe for it. I’m sure that I, or you, could do a lot better so there are a couple of pictures but not gory details. The leek bread pudding itself was a new experience for me. Although the English do love their bread and butter pudding, I am not a native English-person and it does not appeal to me that much really. 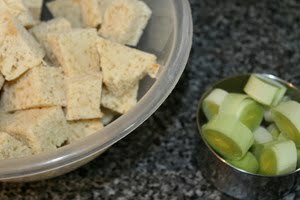 I find it a bit stodgy and the thought of bread for dessert after dinner is a bit intimidating. 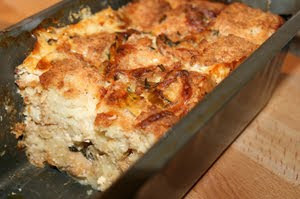 But this idea of a bread pudding, with leek herbs and cheese, for dinner itself… now thats something that does tickle a few of my tastebuds. It was not a difficult or time-consuming recipe, and the smells of cooking leeks and browning brioche go a long way towards stirring up your appetite on a Sunday afternoon. I also find something so homely any comforting about home-cooking smells. No matter how bad a day I may have had or how rainy and grey the day is, the warm, welcoming smells of my kitchen never fail to make me smile. It also reminds me of how I have my own kitchen, and how lucky I am for that. And also how far I have come from the days when I used to make pinwheel biscuits and lamingtons in my mom’s kitchen when I was in my early to mid teens. I didn’t realise back then how much I enjoyed cooking/baking. Maybe if I had I would have pursued a food-related career, but how it turned out, cooking is my solace and my escape. My mind has always been methodical and logical and following and developing a recipe allows brain work without complications. I love it. This bread pudding tastes great the next day to, maybe even better from it overnight chance for the flavours to settle and cosy together. So don’t be intimidated by the size of a whole loaf, go for it – you won’t regret it. Makes one loaf. Double the recipe to fit in a 9×13 baking dish. 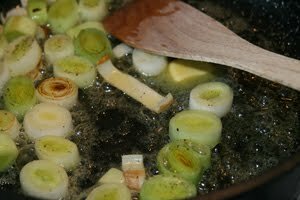 Place a medium sauté pan over medium-high heat, drain excess water from leeks, and add to pan. 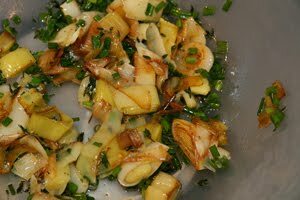 Season with salt, and sauté until leeks begin to soften, about 5 minutes, then reduce heat to medium-low. Stir in butter. Cover and cook, stirring occasionally, until leeks are very soft, about 20 minutes. Adjust salt and pepper to taste. Preheat oven to 350 degrees. 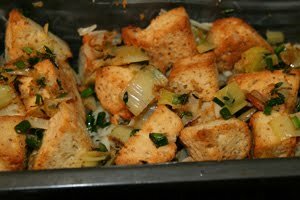 While leeks are cooking, spread bread cubes on a baking sheet and bake until dry and pale gold, about 15 to 20 minutes (my already-stale brioche took less time to brown), turning pan about halfway through. Transfer to a large bowl, leaving the oven on. 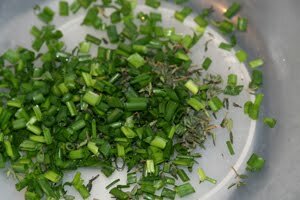 Add leeks, chives and thyme to the bowl of bread; toss well. 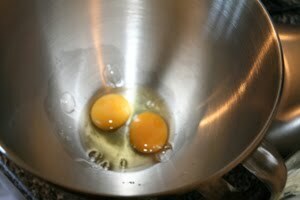 In another large bowl, lightly whisk the egg and egg yolks, then whisk in milk or cream, a generous pinch of salt, pepper to taste and a pinch of nutmeg. 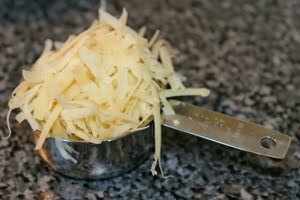 Sprinkle 2 tablespoons shredded cheese in bottom of a buttered 9-by-5-inch loaf pan. 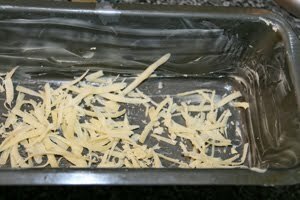 Spread 1/2 of bread mixture in pan, and sprinkle with another 2 tablespoons cheese. Spread remaining bread mixture in pan, and sprinkle with another 1/4 cup cheese. 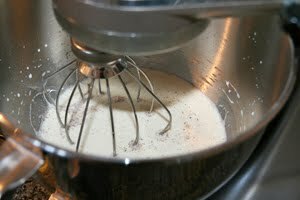 Pour in enough milk mixture to cover bread, and gently press on bread so milk soaks in. Let rest 15 minutes.